We might all despair when we see clouds in the sky but they are playing a vital role in the energy balance of the planet by reflecting and absorbing solar radiation. But what about other planets? 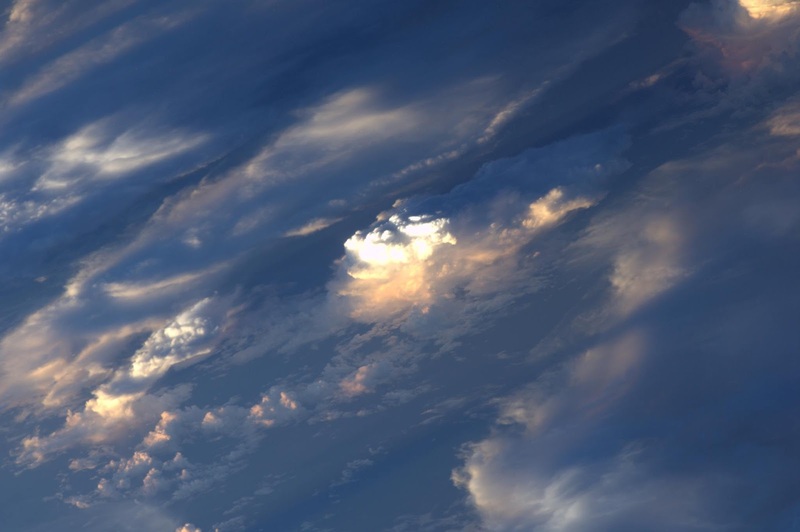 Every planet in our solar system with an atmosphere has clouds. Some of them are highly reflective like Earths water vapour clouds, while others are absorbers giving the planets the colours that we see. Like us Venus has strongly reflective clouds, although on Venus these are made of hydrosulfuric acid and would be far more foreboding than any clouds we get on Earth. These clouds reflect almost 75% of the sunlight that falls on them making them completely opaque. If you were to stand on the surface very little sunlight would reach you and at most you would be able to see ~3km, whereas on Earth you can see over 4.7km from eye lever and over 200km from the top of a tall mountain. Jupiter and Saturn have very hazy atmospheres. A haze is comprised of very small particles in the atmosphere that absorb radiation and contribute to the colour of the atmosphere. These are almost always photochemical produced, formed by a reaction with sunlight in the upper atmosphere. Jupiter has several different cloud layers of ammonia, ammonia hydrosulphide, and water vapour with deeper cloud decks at higher pressures as you go down through its atmosphere. You can clear see the shapes that the cloud form on Jupiter with the famous Big Red Spot cloud formation which is through to be a hurricane that has been raging in Jupiter's atmosphere for over 400 years. Saturn has a similar cloud structure to Jupiter with big up ammonia clouds followed by ammonia hydrosulphide, and water vapour clouds as you head towards its interior. It is incredibly windy in Saturn's atmosphere with wind speeds reaching 1,800 Km/h producing storms which can occasionally be seen through the haze and smog in the upper atmosphere that obscures the lower cloud decks. 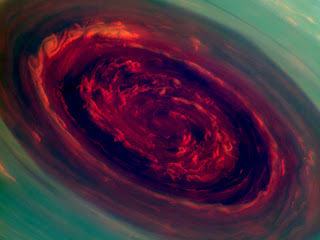 One such storm observed by NASA's Cassini spacecraft orbiting Saturn revealed a giant hurricane, 20 times the size of the Earth, trapped at the planets northern pole with the eye of the storm giving us a look through the cloud layers of the planets atmosphere. The diversity of clouds is enormous - from particle size, vertical extent, cloud composition. From Earths water vapour clouds with particle sizes from 10 to 100 micrometers, to Titans methane clouds, and Jupiter and Saturn's high altitude hazes. Exoplanets are also thought to have a large diversity in cloud composition, position, and composition. The currently accessible atmosphere so hot Jupiter atmospheres through transmission spectroscopy and emission spectroscopy during secondary eclipse are already showing a wide range in detected species, from Sodium and potassium peaks in the optical to water in the infrared. Hot Jupiter's are likely have clouds formed of liquid Iron droplets due to their high temperatures with solid silicates and other high temperature condensates that contribute the haze and colour of these worlds. 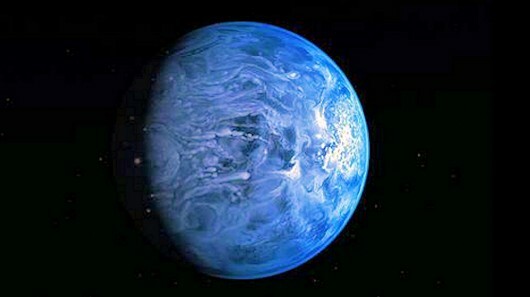 A recent study of the exoplanet HD189733b revealed that it would appear a deep cobalt blue if viewed directly. This is due to silicate hazes in the upper atmosphere which scatter blue light. Understanding the composition of Exoplanet atmospheres is key to get a look into their formation as well as the energy balance of these atmospheres where high stellar irradiation could play a key part in the production of obscuring hazes. We still do not completely understand where the colour of planetary atmospheres and new observations with ever advancing technology the puzzle pieces are falling into place. A lot of the information is from a book by Sara Seager - Exoplanet Atmospheres which is a fantastic read if you want to really get into the details math, physics, and chemistry of planetary atmospheres. IMAGE CREDITS: Luca Parmitano (@astro_luca) from the ISS, NASA, NASA Cassini, NASA/ESA press release.